Watch Sky Go abroad 2019: The ultimate guide to unblock Sky Go now! Home » Articles and guides » Access blocked sites » Watch Sky Go abroad 2019: The ultimate guide to unblock Sky Go! Sky Go is an online television service from Sky UK, the UK’s largest pay-TV broadcaster. It’s been launched in 2006, the year a whale took a dip in the River Thames in London, remember this one? And it allows users to watch live and on-demand video content on all their devices. If you’re among the lucky subscribers, you know how awesome it is. However, the content is geographically restricted to the United Kingdom only. Therefore, you can’t watch Sky Go abroad. Or can you? I get asked that a lot. So, I decided to write an article with your answer! Can I watch Sky Go abroad? Thank you for reading my article. Next, I’m going to tell you how to choose a VPN! Wait a minute, I’m just kidding here. This post is about watching Sky Go abroad and only that. So you can’t get Sky Go when you’re overseas. But most UK TV services are blocked outside of the country anyway. You didn’t know? Try to watch BBC iPlayer or ITV when travelling abroad. And you’ll be disappointed. Therefore the answer to the question “can I use Sky Go abroad?” is no. Streaming Sky Go is impossible when you’re unprepared. Or when you don’t have the right tool (more on this in the next paragraph). Despite having a subscription, which can be frustrating! Yet, there’s a solution to binge watch Sky Go outside UK. A 100% legal solution, to get the best streaming experience from the official website or Sky Go app: Nothing more, nothing less. The magic workaround holds in only 3 letters: VPN. Indeed, you just need to subscribe to a Virtual Private Network. I let you discover what is a VPN. But what you need to know for now is that with a Sky Go VPN software, you can emulate your location in the UK. And almost anywhere in the world, where your provider provides a server. And in our case, in the UK – most VPN providers offer a UK server. Basically, the VPN server acts as an intermediary between your device and the website you want to reach. And when you connect your VPN, all your traffic goes through this server. With a server located in the UK, the satellite broadcaster considers that you’re located in the UK – even when you’re not. All you need is to access Sky Go with a stable internet connection. 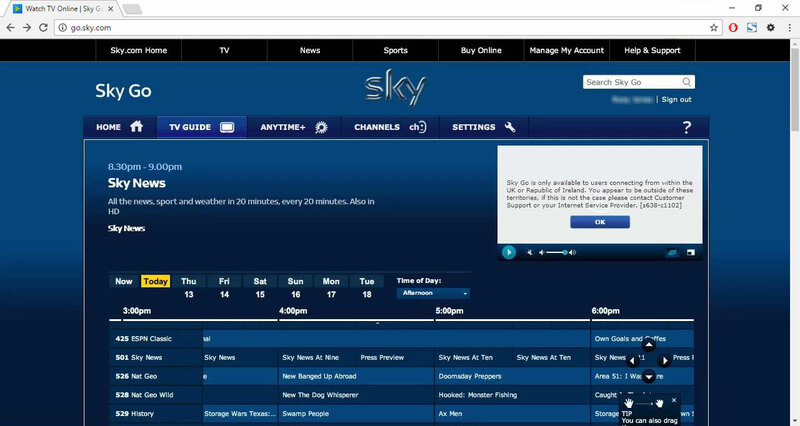 As a result, the Sky Go content is not restricted anymore. Jack’s back. If you want the best VPN for Sky Go, enjoy ExpressVPN with my exclusive offer now. As you know, there’s almost an unlimited range of channels. And with a VPN software, you’ll be able to unlock all of them: Entertainment, Kids, Documentaries, News, International, Movies and Sports. So you can enjoy the full experience, as you would if you were on your couch at home. Take a glimpse below at what you’ll be able to access. So now you’ve got a basic knowledge about VPNs, how they work, how much they cost. But which one should you choose in this case? Indeed, this question is crucial. But do not worry dear reader, I’m here to share my experience with you! So you don’t have to waste your time and money trying them all by yourself. And you don’t have to search for “Sky Go unable to stream VPN” on Google… Yeah, I know some of you just did! The selection of VPN I made below is based on 3 criteria: First of all, I like some VPNs better than others. I can’t help it, I’m human. So depending on how easy it was to subscribe, how easy it was to install and set up, I have my favourite one. But If I find a VPN user-friendly, you should as well, right? That’s the reason why my experience with the VPN influence the ranking. The second thing is the speed of the VPN. Because you want to stream videos, not browse the Web. So the requirements are much higher for this activity: You need a lot of broadband. Therefore you need a VPN with a premium network and servers. As you can understand, this Top 5 evolves regularly. Because they might get banned if they don’t have enough servers to face the bans. Also, some VPNs might win or loses their spot. But all the VPN services in this list will allow you to make Sky Go work abroad. ExpressVPN SkyGo VyprVPN: Is it for real? To make sure I’m not telling you BS, take a look at the video I recorded at the top of the article. Sorry for the bad quality, I’m not comfortable talking and filming. I’d rather only write reviews and articles! And you’ll see that with ExpressVPN and VyprVPN, you can get Sky Go abroad. Today you’re looking for a VPN for Sky Go. And only that. You may be on vacation or on a business trip for a couple of days. And you don’t want to spend much. Hence you found some free VPN solutions on the market. But beware! In this world, nothing’s really free. The people or organization offering free services are no NGOs. Behind their service is a network with hardware, software and employees. And that’s very expensive! Therefore, if you don’t pay for their service, they have to make money with something else. And your value is in your navigation data. As a result, some unscrupulous companies might use your data for commercial purpose… Hence ruining all your efforts to protect your privacy. Because your provider would read all your data and sell them to advertisers, to the highest bid. And that’s only the best case scenario. Now you know what I think about free VPNs. In addition, I should mention could add that a free VPN will mostly fail to unblock Sky Go. And its speed will be too slow for proper streaming. A good VPN is not free, but it’s cheap, between £5 and £10 for a month. And if you don’t like commitment, you can subscribe for only a month. It’s easy and you won’t have any unpleasant surprise. However, if you subscribe for 6 months to 2 years, you can get much better prices, with over 50% discounts. Now that you know how to watch Sky Go abroad, let me provide you with a very simple step-by-step guide. Because I created TheBestVPN.UK to help you with all VPN things! And this article wouldn’t be complete without a tutorial. While this quick guide is generic, it should work just fine with all the VPN I mentioned above. That’s it! Now you know how to watch Sky TV live outside the UK. And on all your Sky Go devices! So you want to subscribe to a VPN to watch Sky Go outside UK, I get that. In many ways the function is close to a smart DSN proxy. But you should know that a VPN offers many other benefits. Indeed, at the origin, VPNs were developed for security purposes: They’re security tools. First of all, you should always use a VPN while connected to the Internet, on all your devices. Not only when you need the Sky Go live stream on holidays. Because you leave traces of your activity on all the websites you visit. And with all these bits of information, it’s possible to find your location and your identity. Indeed, a VPN improves your privacy and your security. By creating an encrypted tunnel between your computer and its server. Therefore, your data is protected from snoopers (your ISP, your government, or hackers). In addition, it hides your IP address and replaces it with the IP of its own server. So the websites you visit have no clue you’re actually visiting them. Because they consider you’re the server. And you’re browsing anonymously. They know the requests you make, of course, otherwise, they couldn’t deliver the content. But they can’t link the requests to your real IP address. Finally, you can use a VPN to work around censorship and access all the geo-restricted content, not only streaming services. That means you can surf on the open Internet. So you can browse all social media, news or betting sites – from anywhere. Therefore, you can connect to Facebook from China. And you can enjoy the best shows on American Netflix from the UK and get UK TV from abroad. Most VPN providers offer servers on all continents. So you can connect to the country where content is accessible and get around restrictions. And the more servers the better. Because you can unlock more restricted content. Furthermore, should a VPN server be banned, you could easily switch to another one. If you’re a subscriber, you can watch Sky Go abroad with a VPN. And no matter where you travel, for leisure or for work, you’ll be able to enjoy your favourite shows and movies on your Sky Go compatible devices. Because a VPN allows you to pretend to be in the UK, with an English IP address. Furthermore, you should always keep in mind that the satellite broadcaster is trying hard to ban all VPN servers, to protect content producers. And that’s the main reason I’m not mentioning any VPN server working with Sky Go in this article, to protect users from more trouble. So if ever a server stops working, you should get in touch with the VPN customer service. Indeed, they’ll happily tell you what server is working. In conclusion, the providers from my list above offer the best Sky Go VPN available on the market these days. And they’ll help you stream Sky TV live, in addition to protecting your privacy. This was my guide: Watch Sky Go abroad 2019: The ultimate guide to unblock Sky Go! Stay tuned for more articles coming soon.